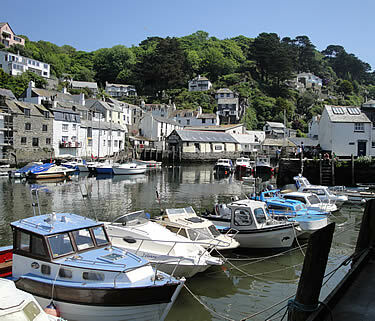 The history of Polperro can be traced back over many centuries, and the village has been known by many names from the days of Henry VIII up to the present day. Whether called Porthpyre, Polpire, Poulpirrhe or Polperro, one common factor spanned the centuries - it was a village next to the sea and in her cottages lived men of the sea earning their living from the oceans. For many years the prosperity of the village depended, in the main, on pilchard fishing, and up to the early part of the 20th century Polperro still had a fine fishing fleet. The devout men in their small boats would sing as they worked, and the hymns sung in Chapel on Sundays would take pride of place in their repertoire. Sadly, with the decline of the fishing industry locally, the fleet fell in numbers. It was Eva Cloke, the wife of a Polperro fisherman, and organist at the Chapel, who realised the value of preserving the tradition of the singing fishermen of Polperro. Tommy Marks, a Polperro fisherman lay-preacher known as ‘The Fishermen’s Bishop’, attracted large congregations to his services. 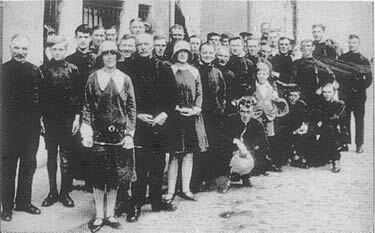 In 1923, Tommy and Eva brought together the singing fishermen to form the first Polperro Fishermen’s Choir, to sing hymns and religious style sea songs in the village. Few, if any, of the choir could read music, but the patient coaching of Eva helped each man to learn his part. 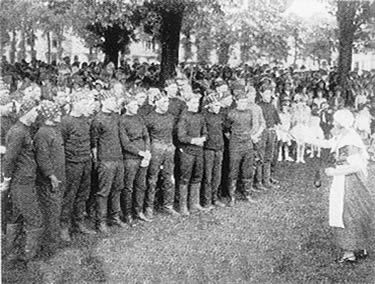 Their uniform was a rough home knitted roll neck woollen jersey, so the choir continued the tradition of the real old days when wives and daughters knitted jumpers for their men folk and each man could be recognised by the pattern on his jumper. It was not until 1982 that the choir modernised and adopted the black blazer and roll-necked shirt by which it is now so easily recognised. 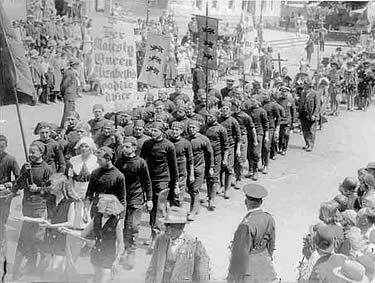 As the fishing industry declined still further so did the number of fishermen, and other men of the village came to swell the choir. Soon they were singing regularly in the village and in other parts of Cornwall, mainly at religious services. There have been many memories built up since then, but one of the saddest times was when founder-conductor Eva Cloke passed away on Christmas Eve 1969 as the choir were singing carols around the village. Jack Libby, son of founder member Jack senior, was a former conductor and musical director of the choir. He joined as a first tenor in 1951 and initially took the baton at a London weekend concert in 1968 when Eva was indisposed. Jack ran the choir for a short time after her death and became deputy conductor when Len Rundle took over for 18 months up to June 1971. Jack Libby then resumed his position as musical director and built up the choir to the point where he was received into the Gorsedd of Cornwall as a Bard in recognition of his services to the choir and to choral music. Jack took the Bardic name “Map Porthpyra”- ‘Son of Polperro’. Arguably one of the most important people in the choir is the accompanist. In the early days Ruth Oliver, daughter of choir member Freddy (Dobbin) Oliver, played the piano with Eva as conductor. Later Florrie Oliver, sister-in-law of Eva and village music teacher, took over the task. Many local girls went to her for music lessons, on of these being Beryl Libby. Beryl, who became Beryl Pannewitz, later became accompanist to the Ladies Choir and often assisted the Fishermen. During the war years the choir was disbanded but in 1951 it was resurrected under the guidance of Eva with her nephew, Jack, as accompanist. The choir as it is today really began at this time when the influence of Jack Libby became noticeable. Vashti Trudeau, daughter of choir member Jack Curtis, was asked to help out. Vashti was succeeded by Maisie Hall, daughter of founder member John Gordon Blatchford. Maisie's great strength was her versatility and musical knowledge. Proud moments include several TV appearances for both BBC and ITV and recordings for BBC Radio, Radio Cornwall and commercial radio. In 1988, together with the Polperro Ladies Choir, the Fishermen appeared in a ‘Festival of Choirs’ at Plymouth Guildhall and at Launceston Central Methodist Church. Other venues have included the Royal Albert Hall, although some have not been as lavish. The condition of some of the organs and pianos encountered by the choir sometimes left much to be desired - such as the piano on which only half of the keys would emit a note, and even those were out of tune. Now, with their own electric piano, the choir no longer has to rely on the condition of instruments at their concert venues. In 1973, the choir’s Golden Jubilee year, they made their first album “Sounds like Polperro” which quickly became a best seller, followed by many other successful recordings which included “Born to Sing” with the Polperro Ladies Choir. New CDs were produced for the 80th and 90th anniversaries of the choir and the choir's current very popular CD is "The Magic of Polperro" celebrating 95 years of singing. Jack Libby retired in 1999 after 48 years with the choir, and the position of musical director and conductor was taken over by Phil Carrigan, a former Royal Marine Bandsman and Musician. Phil has many years of experience in the world of music, and the choir benefited greatly from his expertise and enthusiasm. A story which is sometimes told is of Phil serving in HMS Ark Royal when Sir Rod Stewart recorded his hit “Sailing”. Not so often told is another story involving Phil chasing a “Big Bass Drum” as it rolled down the flight deck of the aircraft carrier! The beginning of 2012 saw the retirement after 25 years sterling service of Maisie Hall, the choir's much loved and respected accompanist. The retirement of the amazing Maisie sent the choir into a flat spin regarding a replacement but, as if by magic, there appeared on the scene the incredibly gifted Lorraine Forsdick. As well as settling into the accompanist spot as if born to it, Lorraine has also composed and arranged a number of songs for the choir. When Phil Carrigan took a 6-month break from the choir in 2017, the magic wand was waved again and Stuart Reeves agreed to accept the role. Being a retired music and drama teacher, Stuart's career has included a wide variety of music, singing and composing. The choir regard themselves as extremely lucky to have found such dedicated and talented musicians prepared to accept the demanding commitment of leading them musically. Although today there are very few true fishermen singing with the choir, the roots and traditions of the choir are deep, and its aims and objectives are as strong as ever. Many charities throughout Cornwall have benefited from the devotion and pure love of singing of all the choir members. Some of been in the choir for a very long time. In 2017, at a concert with BBC TV present, the choir celebrated the very long service of John Pooley and Ken Puckey, who had been in the choir for 45 years, and of Murray Collings who joined in 1952 and had completed an incredible 65 years in the choir. 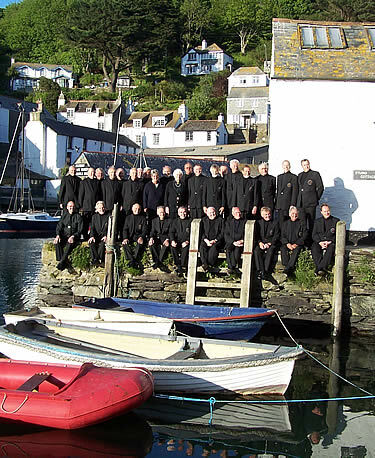 In 2009 the Polperro Wreckers were formed with the idea of singing for fun after the Wednesday choir rehearsal. The Wreckers have become very popular and are much in demand, being very different from the main choir. The Wreckers now contribute considerably to the charitable activities of the choir, often giving an 'afterglow' performance in a nearby pub after a choir concert. The Wreckers have released their own CDs, the latest being "Wrecked at the Mill House". In addition to singing in the UK the choir has in recent years travelled further afield, to venues in the Channel Islands, and to Quiberon in France for the memorable International Festival of Choirs. In 2009 the choir visited the Isle of Scilly, where they performed on St Mary’s and Tresco, and the Isle of Wight in 2010 where a DVD was made of the concert. In October 2015 the choir performed concerts in Waterford, Killarney and Dublin on their tour of Ireland, with the Wreckers also much in evidence afterwards. In 2016 the choir visited Wales for a concert and sang on the deck of The Mumbles lifeboat, and in 2017 a concert in the elegant Assembly Rooms in Devizes raised over £1700 for the RNLI. The choir has fans all over the world. Recent compliments have come from as far afield as the USA, Canada, Europe, Brazil, Colombia, Australia, South Africa, New Zealand - and even Southend-on-Sea. Both the choir and the Wreckers were involved with the award-winning Looe Music Festival since its inception. The choir continues to appear on radio and television, and to develop and innovate under the talented guidance of its excellent music team. From an original article in the Cornish Times, updated by Keith Wilson and David Lashbrooke.